Kleine en minder vaak bezochte havens langs de kust van Noord-West Engeland. Van Drummore in het Noorden naar Liverpool en Chester. Inclusief de Isle of Man. 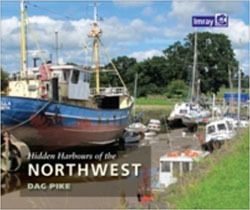 Strictly speaking Dag Pike’s latest tour of historic and often long unused harbours should be titled ‘Hidden Harbours of Northwest England and Southwest Scotland’. Starting from the Dee Estuary and finishing in the remote Rhins of Galloway, over 40 harbours are described. In many instances all that remains is a stone quayside here, a silted dock there and a few old warehouse buildings, but in their heyday the harbours were all flourishing. During the Industrial Revolution boats and waterways were essential to ferry grain, coal and raw materials and also for the export of manufactured goods. In those days these harbours were bustling centres of commerce. This roundup describes so many little known places: Freckleton, an unlikely shipbuilding centre, Georgian Sunderland Point at the mouth of the Lune, the old Roman port of Ravenglass on the Cumbrian coast and, not to be missed as the seaside resort for Millom, Haverigg. The Galloway coast offers more, and few would want to miss lovely Kirkcudbright, Creetown (which exported granite for the building of the Embankment in London) or even Garlieston, from where ferries once ran to the Isle of Man. It’s a fascinating tour. Dag Pike’s guide is an indispensible reference for all explorers by land and sea and an attractive companion to the others in the series: Hidden Harbours of Wales and Hidden Harbours of Southwest Britain. Elke "verborgen" haven heeft zijn eigen verhaal. In dit boek vindt u bij elke haven een kort overzicht van de geschiedenis en aanwijzingen wat daarvan nog terug te vinden is. Verder aanwijzingen hoe de haven over het water of over land te bereiken en korte informatie over aanwezige faciliteiten en contactgegevens van de havenmeester. Geïllustreerd met mooie kleuren (lucht)foto's. Verwacht in dit boek geen complete nautische vaargids, maar wel een hulp bij uw eigen ontdekkingsreis van de kust van Wales.